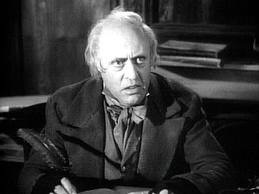 The photo above is of Alastair Sim, who remains (in my view) the nonpareil of filmic Scrooges. Scrooge was of course hard hearted and uncharitable and to the extent that he had a philosophy it was a Benthamite affair and that, as they say, is that. Yet Scrooge’s hidden disability resides in his relationship with Tiny Tim whose visible disability means nothing to the old man until he is forced to look upon the boy’s crutch as a memento mori–for in a probable state of affairs the boy will die. In other words, Scrooge cannot see what is before him but only what is not there. No wonder he was such a good business man! We’ll call this condition hypo-gnostitis, and we shall avow that it’s a particularly virulent condition among people who work in finance or in academia. The abandoned crutch is what saves Scrooge. What will save John Boehner? Here in these terrestrial winter rooms we worry about the poor. We worry about the coming Congress. We saw how the disabled were stripped of cost of living increases in social security when the White House bargained with the GOP to save all those fat cat’s tax breaks. We are steady in our concern that the most vulnerable are about to take a beating. Will the sight of empty wheelchairs tipped in the snow mean anything to the 112th Congress? Heck maybe we can throw in a few crutches? Here in these terrestrial winter rooms one tries to keep the harp in tune. And where are they gone? On their own pair of shoes? I’ll find your wits again .